As the 1% and their state apparatus try to crush the Occupy movement across the US, the 99%’s anger over corporate greed continues to deepen and expand into a broad solidarity movement to defend the Occupy movement and the people’s right to resist a rotten economic system. Occupy Wall Street is part of a global movement because Wall Street’s power, as well as it’s reactionary state violence, is global. On six continents, people are in combat with the forces of monopoly capital that are destroying our lives. The intensifying repression of monopoly capitalist forces continues to be met by the global 99%’s movements for national and social liberation around the world. At the same time, the global 99% continues to amass power and strategy to take down the global 1% through international solidarity, cooperation, and the building of the broad anti-imperialist united front. Last July, in Manila, nearly 500 people from 40 countries attended the Fourth International Assembly of the International League of Peoples Struggle (ILPS). 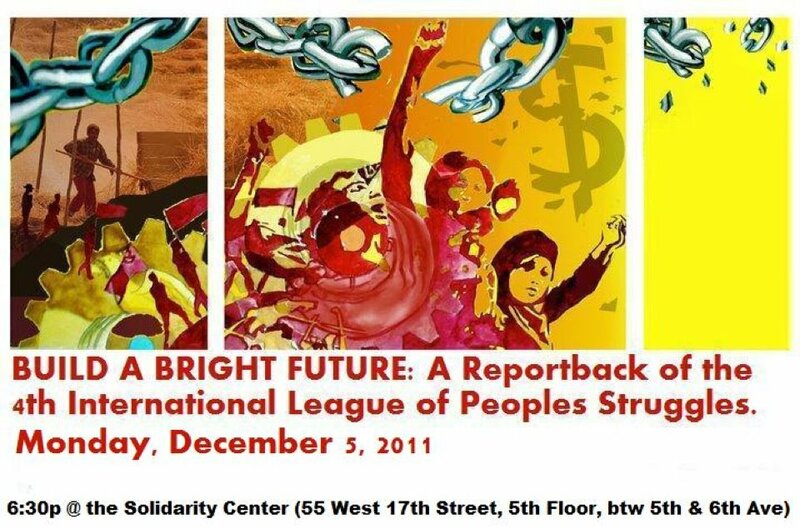 In its decade of existence, the ILPS has grown into the largest international anti-imperialist united front, linking the struggles of workers, farmers, youth, women, migrants, queers, indigenous peoples, eco-activists, and others against the various impacts of monopoly capital all over the world under an umbrella of unity, support, respect and coordination. Join us as several ILPS delegates from New York City reportback on what they experienced in Manila and what it means in the context of Occupy Wall Street. ILPS member organizations in the Tri-State area include the International Action Center, Al-Awda NY, NY May 1st Coalition for Worker and Immigrant Rights, and BAYAN USA.